The post has been shared by	241 people. 2- For obtaining modification factor, the percentage of steel for slab can be assumed from 0.2 to 0.5%. 1- One way slab d=(L/22) to (L/28). The load on slab comprises of Dead load, floor finish and live load. The loads are calculated per unit area (load/m2). However, if the diameter of bar do not exceed 12 mm, or cover may be reduced by 5 mm. Thus for main reinforcement up to 12 mm diameter bar and for mild exposure, the nominal cover is 15 mm. 1- 0.15% of the total cross sectional area for Fe-250 steel. 2- 0.12% of the total cross-sectional area for Fe-415 & Fe-500 steel. 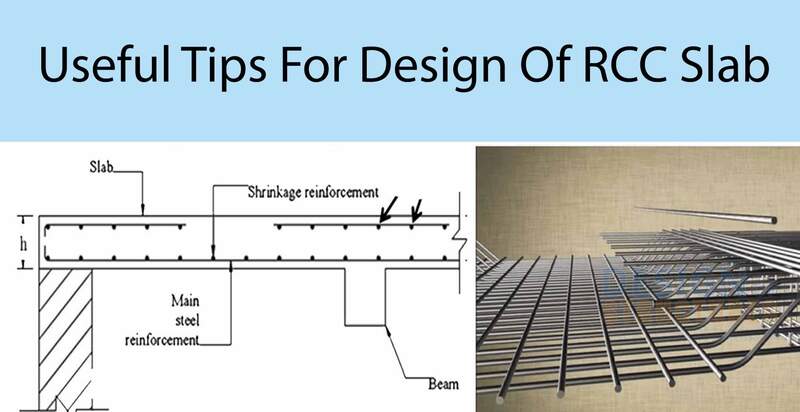 2- Distribution steel –5d or 450 mm whichever is smaller Where, ‘d’ is the effective depth of slab. Note: The minimum clear spacing of bars is not kept less than 75 mm (Preferably 100 mm) though code do not recommend any value. The maximum diameter of bar in slab, shall not exceed D/8, where D is the total thickness of slab.